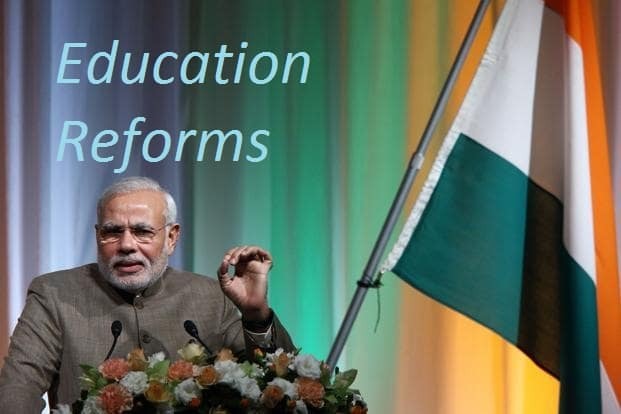 The Indian system of education needs reforms and reconstruction to suffice in the present age of growth and development- This view was presented by Narendra Modi, the Indian Prime Minister while suggesting a series of structural reforms in education. While the access to school education has more or less been achieved, the problem is with the quality of education which has to be made up-to-mark. For this, the reforms include schools to display grade-wise learning goals for each class for which Niti Ayog has been entrusted to overhaul the University Grants Commission as well as the All India Council of Technical Education (AICTE). A detailed report of the meeting held with PM and Smriti Irani, HRD Minister has been made by Niti Ayog, which needs to be followed at all levels.A new concept where school students are required to evaluate their teachers has been introduced. Moreover, many teacher-training universities plan to be opened. In addition,the meeting emphasized on outcomes, be it school or higher education or even vocational education. The UGC/AICTE have been criticized for their functioning and complete failure as regulators. Niti Ayog would be recommending big changes so that all the present concerns in higher and technical education can be dealt with effectively. During the meeting, it has also been decided to grade schools and start remedial classes for weaker students. At regular intervals, national/regional workshops will be held for sharing best practices.